How Much is Your Decal Giving Away? In the past few years, it seems to have become fashionable to advertise your children’s activities or your family structure on the back window of your vehicle. It’s all in good fun, and parents as well as kids feel proud to display their achievements. But exactly how much information are you really giving out to strangers? 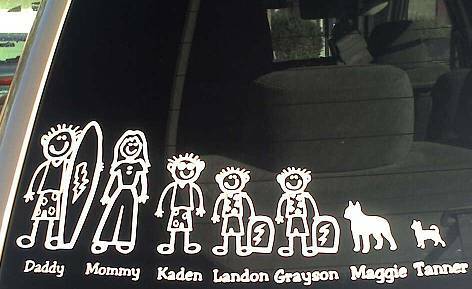 From the decal above, we can figure out that there are 2 parents, 3 boys and 2 dogs. It appears as if this family enjoys surfing and boogie-boarding. That’s pretty vague isn’t it? But what happens when you use a more specific decal? 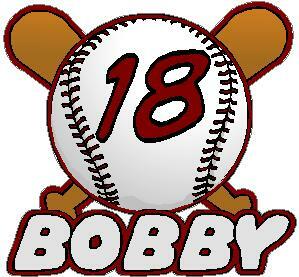 Now we know there’s a boy named Bobby who plays baseball in jersey # 18. If you live in a big city, this still leaves a lot of questions as to who “Bobby” might be. If you live in a small town, this may tell you exactly who Bobby is! And believe it or not, decals get even more specific than this! I was behind a mani-van that had a sticker on the back that advertised a Cub Scout Pack, gave the Pack number and the name of the child! All I would have to do is a minimal amount of research on the Internet to find out where and when this pack meets, show up and ask for the child whose name I saw on the back of the van. If I were to really conduct this kind of experiment, I would hand the child a letter, telling his or her parents how I found the child, how easy it was to do and to encourage a little more anonymity in public. I wish I could say it’s a completely safe world out there, but we all know that I’d be lying. Taking care of yourself and your family often times means using your common sense and critical thinking skills instead of following the pack blindly. There are many decals that don’t give away much information, but if you have one that might, please remove it and spread the word to others. We want all of our readers to be safe and happy! I totally agree -and it’s the very reason I never bought decals! Thanks Julie! And thank you for sharing your article with us!